The hike is a two-mile loop and takes only one hour and a half to complete, but once you start walking on the trail, you’ll feel like you’re inside a time machine and you will not want to leave. This sacred land was home to the Cahuilla Indians centuries ago and the remains of their daily life and culture such as rock art, housepits, foundations, irrigation ditches, dams, reservoirs, trails, and food preparation areas still exist in the canyon. Eight different points of interest marked along the trail make it more than just a hike, but something of an educational experience. The most interesting landmarks are the large sacred rock covered with art dating back 1,000 to 1,600 years ago and the rock mortar used for grinding grain. These traces of life at every corner make this hike more an anthropological adventure than a workout. The fact that there are so many to discover along the way, makes the whole experience feel like a fun scavenger hunt. The landscape is mesmerizing, as well. The stream of water flowing through the canyon brings the most beautiful vegetation including western sycamores, bushes of honey mesquite, desert apricot, and red-budding chuparosa, to name a few. A few little bridges along the stream allow crossing one side to another to explore different rock formations or views. At about 3/4 of a mile in, the trail starts to incline 300 feet through a series of rock steps cut into the canyon side. These steps will lead you to the highlight of the trail: the 50-foot waterfall, which plunges gloriously into a pool creating the most relaxing oasis in Palm Springs. 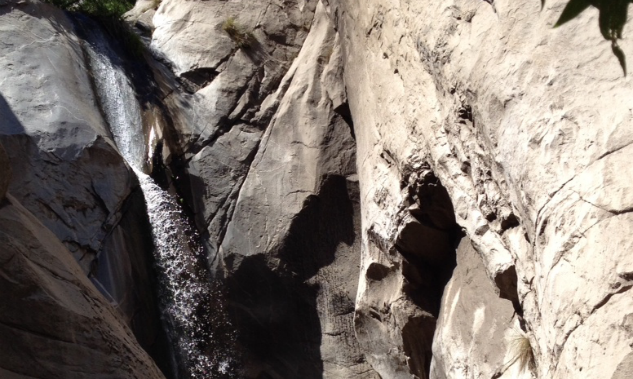 It’s absolutely accurate what the map says about the Tahquitz Falls: It’s a place of power that rejuvenates and energizes. It’s refreshing, tranquil, and spiritual. 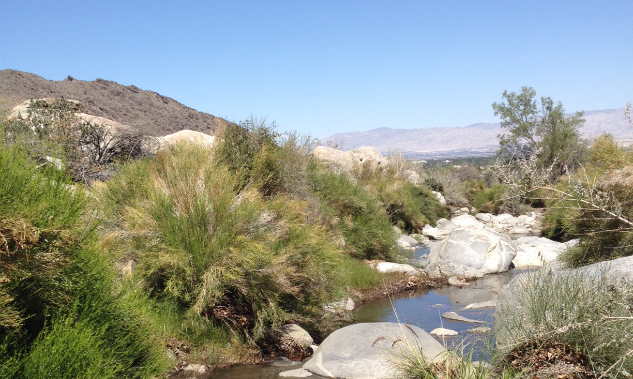 Who would have thought Palm Springs had such a great gem?